Corn Glycol: A cost effective, environmentally friendly solar thermal transfer solution made from corn. If you are using propylene glycol in your solar thermal installations, this is a product you should be offering to your customers. Hood Chemical has partnered directly with one of the leading U.S. chemical companies to develop an exclusive solar-formula glycol made from corn that out-performs every propylene glycol product on the market, at about the same cost. Corn glycol is approximately the same price as the propylene glycol you purchase locally, but with a long list of advantages. No other brand of propylene or corn glycol can deliver this level of performance for solar thermal use. Our custom solar-formula corn glycol has superior corrosion inhibitors, lower surface tension (it’s “wetter”) and our corn glycol has a solar-perfect PH. We ship it in convenient 5-gallon containers, 55 gallon drums and 265 gallon totes. In solar water heating applications, glycol is used to keep the heat transfer solution (water) from freezing at night in cold climates. Even in warm climates like Florida, water can freeze overnight causing damage to the solar thermal system as well as the structure it is installed upon. For this reason, all reputable solar contractors will automatically use a glycol-water mix as the heat transfer medium. In southern climates a 33% glycol solution is typical, with 50% being the norm in colder climates. 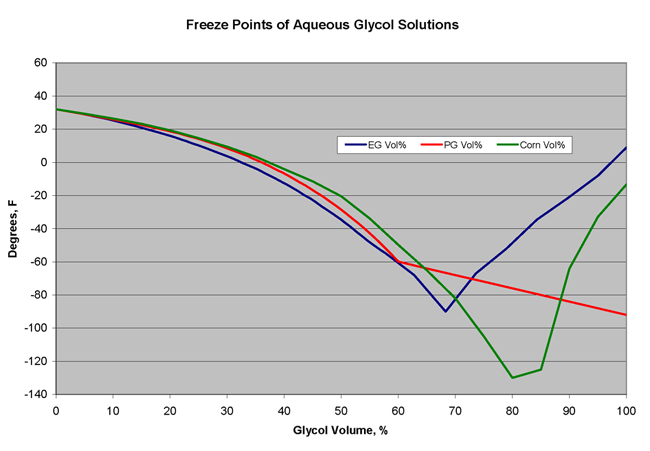 Glycol is an anti-freeze solution. In common use there are two primary types of glycol: ethylene glycol (monoethylene glycol (MEG), 1,2-ethanediol) is used for automotive anti-freeze. It is a highly toxic substance and is not used for solar thermal applications due to the danger of poisoning. In solar thermal applications, propylene glycol (propane-1,2-diol) is used because it is non-toxic. Due to it’s similar properties to ethylene glycol, propylene glycol has quickly become the solar industry norm. Other areas you may find propylene glycol in use include moisturizers, cosmetics, deodorant sticks, toothpaste, emulsifying agents, food colorings and flavorings, electronic smoke devices, and as a coolant in cooling systems. So What Makes Corn Glycol Better Than Propylene Glycol? 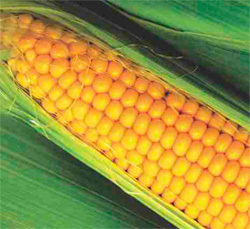 Corn glycol is a non-toxic, safe glycol with antifreeze properties that has the same molecular formula as propylene glycol (C3H8O2). This environmentally friendly, or green glycol, is our solar glycol of choice for thermal transfer. This renewable glycol is an excellent heat transfer fluid for solar hot water heaters and provides a safer, more efficient solution than does propylene glycol. Only through a special catalytic process are chemical engineers able to turn corn into propylene glycol. To actually create this thermal transfer fluid, the corn is broken down into lactic acid, and by utilizing copper ions as a catalyst, with hydrogen gas present, transform the chemical make-up of the lactic acid into propylene glycol. Corn glycol has been shown in studies to actually be a more efficient form of propylene glycol as a heat transfer solution. What Makes Corn Glycol an Eco-Friendly and Safe Glycol? Not only is the corn glycol formed in this process considered a green glycol, the approach itself is more environmentally friendly, resulting in fewer pollutants and unwanted byproducts like alcohols. The method of creating propylene glycol is less efficient and harmful to the environment due to its use of petroleum based starting materials. The starting materials for corn glycol are completely renewable, making this the method of choice for producing thermal transfer fluid. As far as the safety of Hood Chemical corn glycol – it has extremely low toxicity and is even recognized as being safe for food additive purposes. With this safe glycol, we can rest a bit easier knowing children and animals cannot cause fatal harm to themselves if small amounts are ingested, or, if some glycol accidentally finds it’s way into potable water. Using safe and renewable resources to make non-toxic anti-freeze, an important chemical with a plethora of applications, is a wonderful “green” scientific advancement. If you are looking for an environmentally friendly, safe, non-toxic, solar glycol mix for your solar hot water applications, corn glycol is the medium of choice. Make sure to place your order for our special Hood Chemical formula of corn glycol to fuel your thermal transfer applications today. The Hood Chemical solar glycol has better viscosity, better heat transfer, better anti-corrosive values protection, proper PH and best of all it’s 100% renewable.